The main massage feature i.e. the backrest massage in Real Relax massage chair is perhaps a bit offbeat from the rest in the breed. 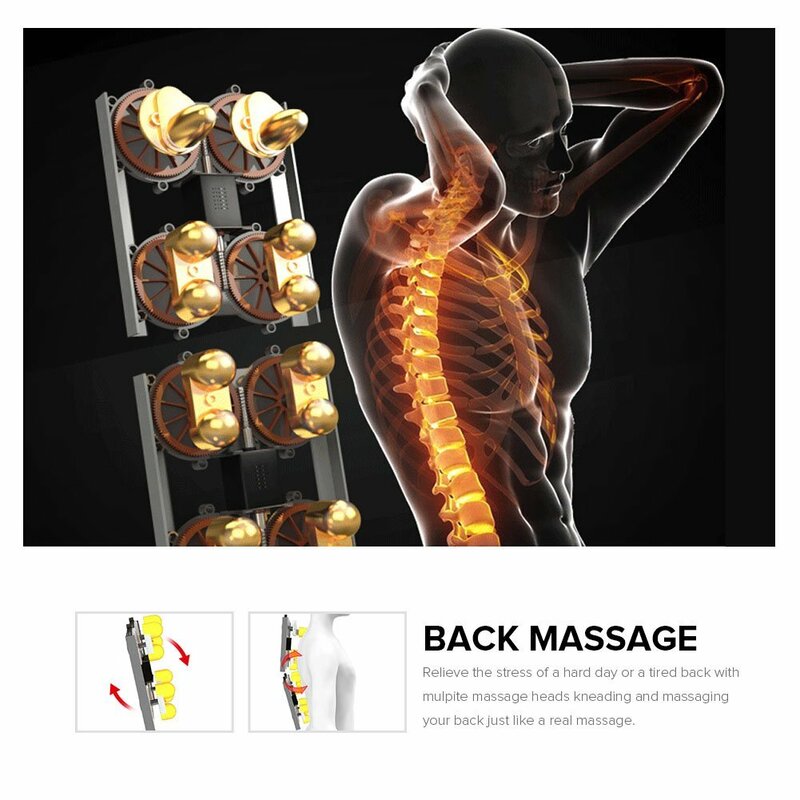 Instead of having quad rollers in the back that typically move up and down, Real Relax massage chair has 8 fixed Shiatsu massage units distributed equally across critical pressure points in the backrest. In any case, comparing with other brands in this price range, it has high number of reviews and relatively an impressive rating as well. 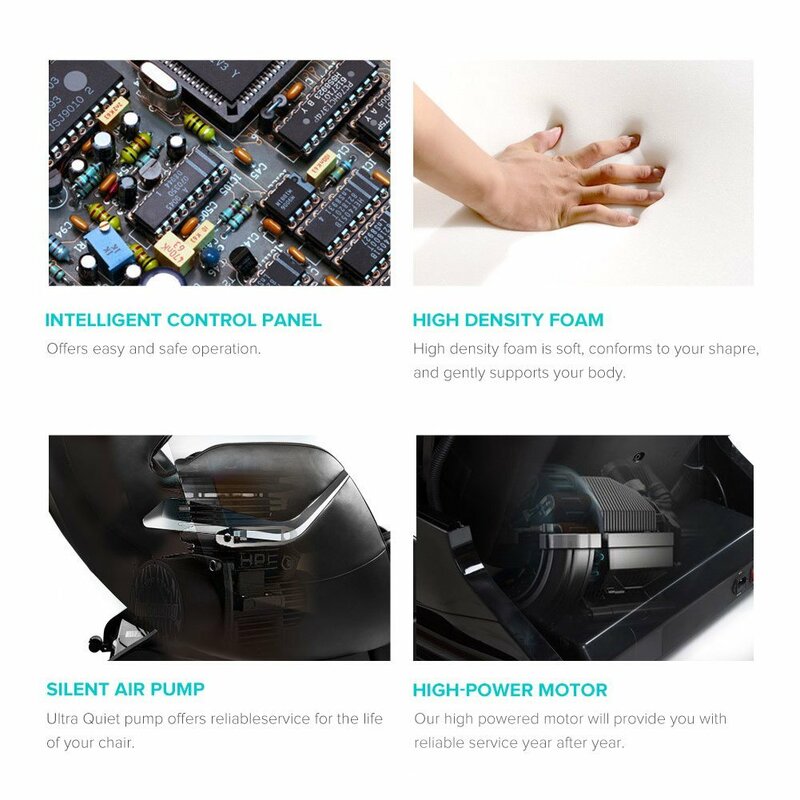 Before moving into detailed Real Relax massage chair review, following is a quick snapshot of feature table. With the absence of quad rollers in the backrest, this is neither an S track model nor an L track model. 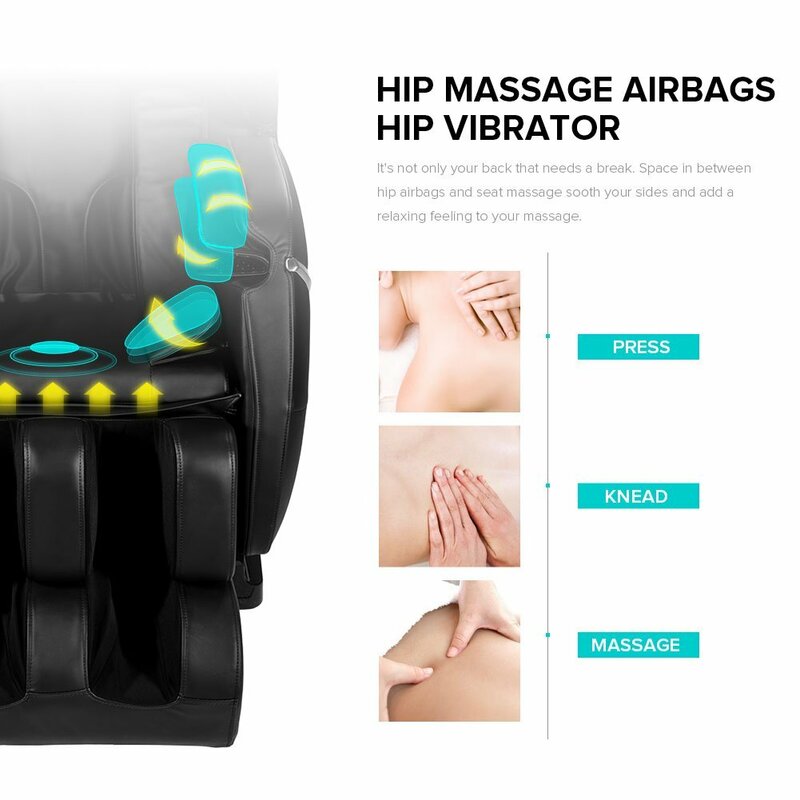 However, just like in S track design where the rollers focus on upper and lower back, in this Real Relax massage chair, the embedded massage units are fixed on the backrest frame. Spread across critical pressure points, these individual Shiatsu massage units sync with each other while performing massage and thus their radius covers pretty much entire upper and lower back. Body scan is mainly important when you have quad rollers. But as this chair has fixed massagers that can’t adjust with variable height, the body scan feature hasn’t been incorporated. Nonetheless, with 8 massagers in the backrest from top to bottom on both sides, the massage does spread to every inch in your back. But owing to lack of height adjustability, the intensity at critical points might be either accurate or an inch away. Although the total number of preset massage programs are 4 but there is a catch in this. These seem to offer more or less the same variation of Shiatsu mode. The intensity might differ but the massage feel and experience remains the same even when you switch from one program to another. The massage modes are again limited to shiatsu and vibration. While shiatsu is an absolute must in any massage chair but vibration is again not focused to one specific zone in our body. It simply vibrates the seating plate thus shaking the entire upper and lower body. With only shiatsu and no specific kneading, tapping or knocking there is no provision for opting for combinations of massage. However, the 4 auto-programs perform the combination job with different intensity levels. Airbags, as many as 50, are placed around arms, shoulders, hips, seat, calves, legs and feet. While rollers are not included in the backrest but they surely are present in calves and feet section along with airbags. The provide double the massage experience. People with soft and sensitive feet might find the foot rollers a bit too hard initially until they get used to them. This is the same with any massage chair with feet rollers not just a case with Real Relax massage chair. A quick solution, put on your socks with some padding or plain souls inside until your feet get used to feet rollers. Airbags are also included in the feet section along with the rollers. While the rollers massage the feet’s soul area, the airbags massage the ankle and top of the feet. Firstly, zero-gravity is simply an advanced feature but surely seen all massage chairs in this price range. With both head and leg section raised in the air and back resting flat, it’s a weightless position for experiencing quick and perfect relaxation. Add massage to it and your happiness will have no bound attached it as you experience some outstanding relief. Quad rollers on the backrest would have given you that ultimate massage but with only shiatsu units the overall experience might fall slightly short. 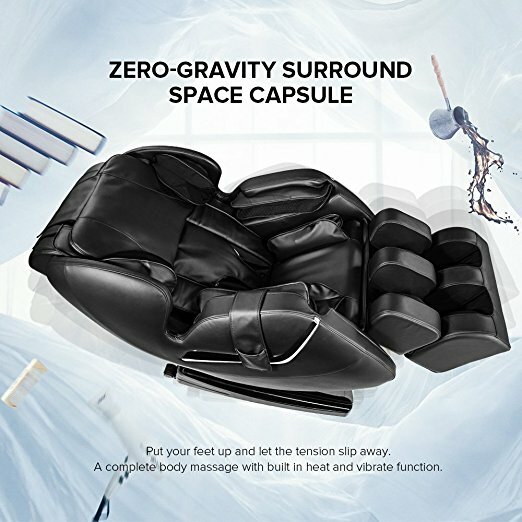 But you can still call it penultimate level of relaxation with Real Relax massage chair’s zero-gravity position. 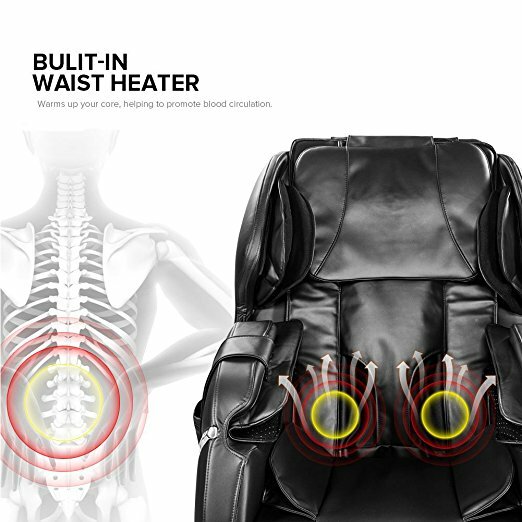 The vibration plate, like in all massage chairs, is placed under the seating pad along with the heater and seat airbags. The vibration is not exactly the same like massage but it is relatively powerful and shakes your entire body. The heat generated by the heating pad is mild and when combined with air massage it helps in enhanced blood circulation. 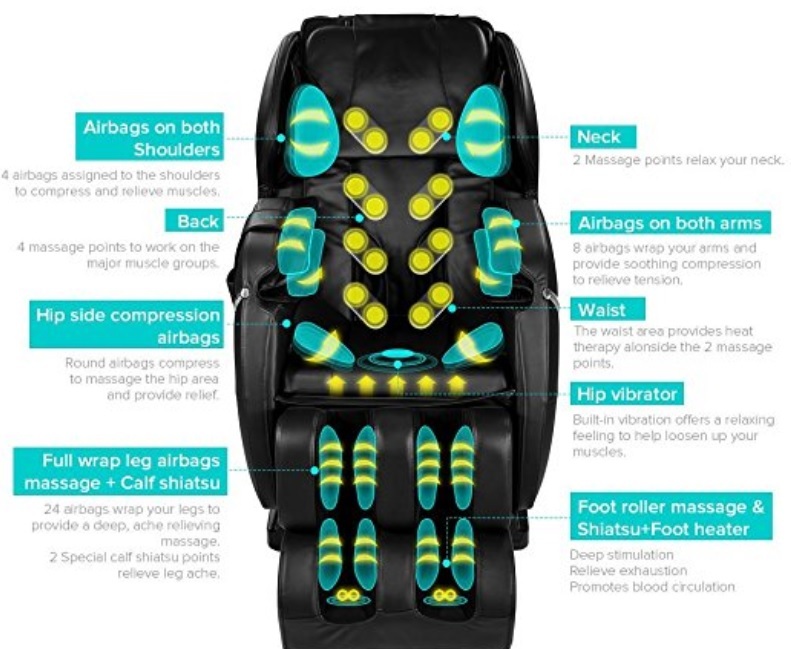 Real Relax massage chair has almost all the basic massage features along with zero-gravity. One major variation, the shiatsu massage units in the backrest instead of quad rollers is a new design experimented or pioneered for the first time. Nonetheless, it surely has impressed consumers which reflect in the number of reviews it garnered and the top level rating. While many massage chairs are stranded between 3 and 4 rating out of 5, Real Relax massage chair scored an impressive 4+ rating.